Concord Entertainment Ltd, the largest amusement and entertainment company of the country and Dhaka ice cream Industries Ltd is going to organize a biggest painting competition for the children this year. The event “Polar ice Cream Moner sukhe Aki” will be held at Fantasy Kingdom Complex in Ashulia on 26th March. At a press conference held at the Fantasy Kingdom on 16 March (Friday) evening the organizers informed about the competition in detail. The competition will feature paintings by children aged between five and sixteen. A total 1200 children will take participate this year. Based on age, children will divide into three groups--'Ka,' 'Kha,'and 'Ga' (each group will contain 400 children). Online registration is compulsory for participate this competition. The registration already has started from 16th March. The last date of registration is 23rd March. Children are allowed to paint on any subject, in any medium. You will have to follow the Facebook page of Polar ice cream or Fantasy Kingdom Complex to get the update of the competition, participate in the event and all kinds of information. For registration, visit—bit.ly/monershukheaki. Through FIFO (first in first out) process, confirmed applicants will be given an SMS with code in their mobile which will have to show during inter into the Fantasy Kingdom Complex gate. Only one guardian will be allowed with each participant. Every participant will get free rides, and launch opportunity with free entry. Mostafa Monowar, well known artist of the country and group of experienced teachers and students of Charukala will be presented as judges of the event. The two hours competition will be started around 11:00am. The award giving ceremony will be held at the same venue around 2:30pm which will continue up to 5:00pm. Finally, 10 participants will be selected from each group. A total of 30 awards, including 3 gold medals, silver medals, 3 bronze medals, and 30 certificates and crest will be given. Concord Entertainment Ltd and Dhaka ice cream Industries Ltd had organized such event for first time last year where 800 children had took participate. We had arranged such art competition last year where 800 children had took participate but this year the number of the participants has been extended to 1200 this year as we got a lot of encouragement from people and participant last year, said Anup Kumar Sarker Executive Directory Marketing of Concord Entertainment Co Ltd. Among others, Major Manzoor Ahmed (Retd. 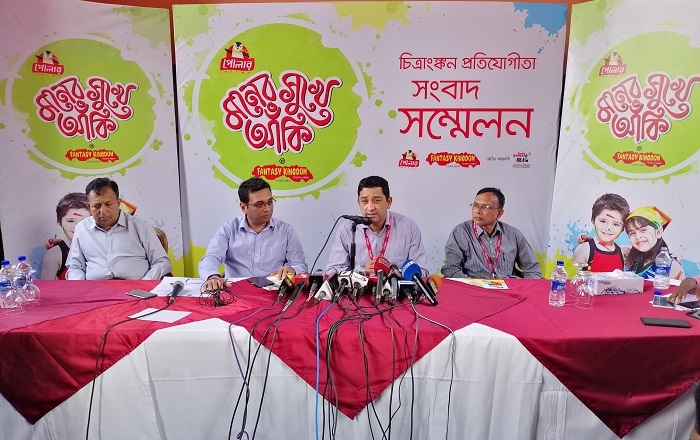 ), General Manager of Fantasy Kingdom Complex, Mehraj Hamid, Head of HR& Administration of Dhaka Ice Cream Industries Ltd, Suranjan Kumar Saha, Regional Sales Manager of Dhaka Ice Cream Industries Ltd were present at the press conference.